You see it all day, every day. You open your inbox and there it is: your name in the subject line. You get home from work after a busy day, kick up your feet and flip on Netflix—and there it is again: your name. You sign into Facebook and you see an ad pointing you to a website you recently visited. The aforementioned examples are all instances of online personalization (sometimes called content personalization). BusinessDictionary defines online personalization as “tailoring the presentation of a website’s content to match a specific user’s instructions or preferences.” This form of custom-tailored marketing is achieved by collecting data about prospects and customers, then using that data to tweak online experiences to perfection. Online personalization has become a key part of digital marketing strategies. As humans, we crave customized experiences. A study from the University of Texas at Austin attributes this to our desire for control. Google searches 30 trillion pages, 100 billion times a month. 60 hours of video is uploaded every minute on YouTube. More than 30 billion pieces of content are shared each month on Facebook. Get the point? There’s A LOT of content out there! Online personalization helps you break through the noise and improve your marketing ROI. Personalized emails improve clickthrough rates by 14% and conversion rates by 10%. In-house marketers who personalize web experiences (who are also able to quantify that improvement) see a 19% uplift in sales, on average. Leads nurtured with targeted content produce a 20% increase in sales opportunities. And the list goes on. Hey, online personalization works! Not every business can be a giganto expert at online personalization like Amazon.com (constantly pulling data and signals to personalize their users’ shopping experiences). However, there are a few basic things you can do to hop aboard the online personalization train, today. Online personalization in email marketing is one of the most cost-efficient methods. Don’t always send the same email to everyone on your list. Break your lists down into various segments and tweak your messages accordingly. You’re in the staffing business and you work with companies looking to fill positions in marketing and IT. Segment out the companies that have a need to fill marketing positions into one list. Then, send a monthly email featuring your top marketing candidates. Likewise, create a separate segment for companies looking to fill IT positions. Send a separate monthly email featuring your top IT candidates to this list. Sending a monthly e-newsletter? Most email marketing software (like MailChimp and Constant Contact) offer the option to insert a ‘receiver name’ field. Use it! Facebook uses data in ad targeting that’s fairly easy to implement. Let’s say you offer computer repair services to small- and medium-sized businesses and you’re only able to offer those services within 50 miles of Brookfield, Wisconsin. You’re not going to want to run a Facebook ad that will be seen by everyone and anyone in the entire United States. Determine what your target audience looks like and set up your ad accordingly. Online personalization is not only a great way to break through the marketing noise and improve your marketing ROI—it’s also a really fun way to get creative with how you market to your audience! Give it a shot and you’ll be amazed at the results. Need some help getting started with online personalization? Contact Cultivate Communications. 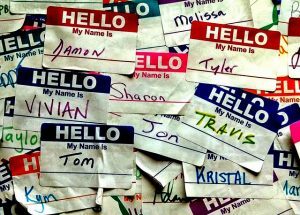 Image “Hello My Name Is” courtesy of Flickr user Travis Wise licensed under CC by 2.0.